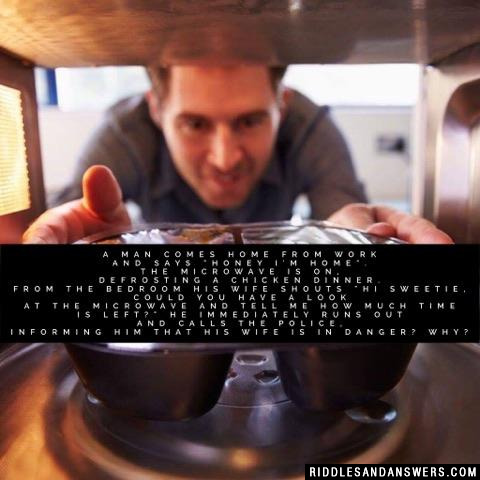 Our staffers are continually on the search for sources of tough riddles to solve, with the solutions given if needed. If you may be searching for ways to develop your brain cells, or need to perplex your buddies? Well then we present you some of the finest brain teasers around. Virtually everyone loves demanding puzzles and brain racking riddles. 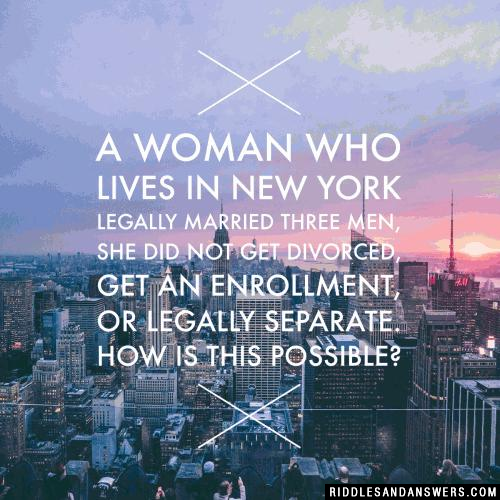 They leave us with the chance to do some of out of the box reasoning and to shake-up our heads. They are also a great activity to do in order to pass some time when you are traveling or alone. 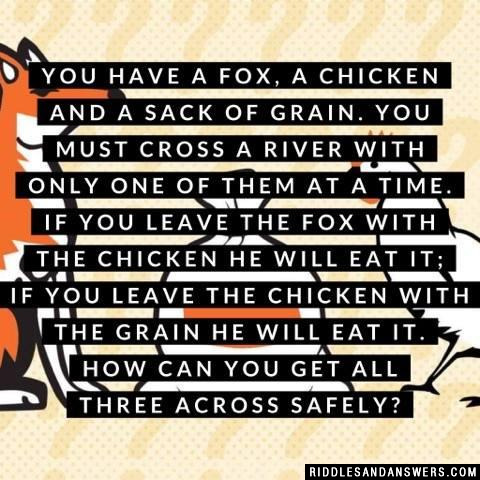 Aside from being fun, these stifling riddles are also very beneficial for the growth of your brain. Studies suggest that regular problem solving among other activities, energizes the mind and decreases the risk of memory loss later in life. Let's get going! 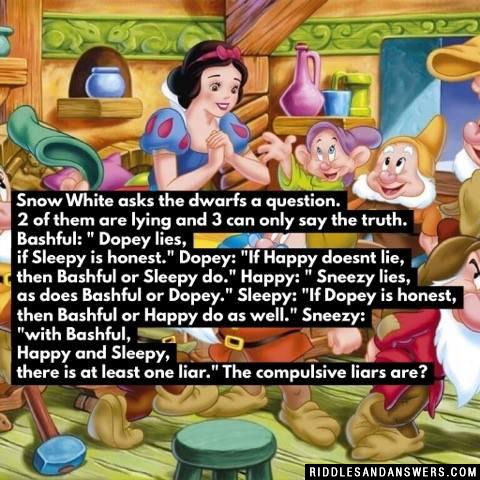 Listed in this section are some great riddles to solve with answers. 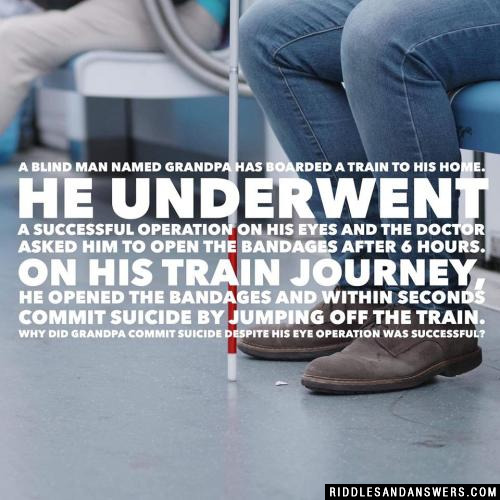 A Blind Man has 2 red pills and 2 blue pills in his hand. 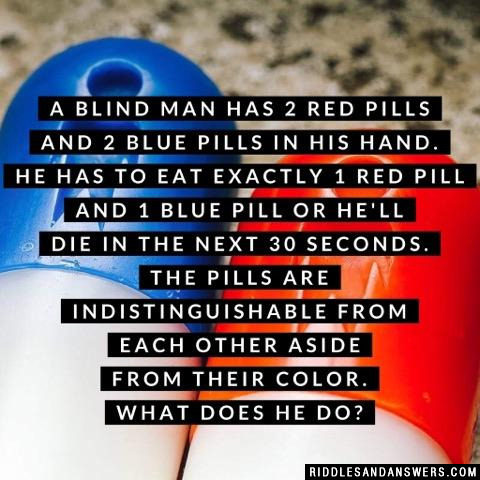 He has to eat exactly 1 red pill and 1 blue pill or he'll die in the next 30 seconds. The pills are indistinguishable from each other aside from their color. What does he do? Break each of the pills in half, as you do this pop one half in your mouth and lay the other half aside for tomorrow. When he’s done this with all four pills he will have consumed one red pill and one blue pill. And have the same left over. Bob is dead in the INSIDE of his apartment. 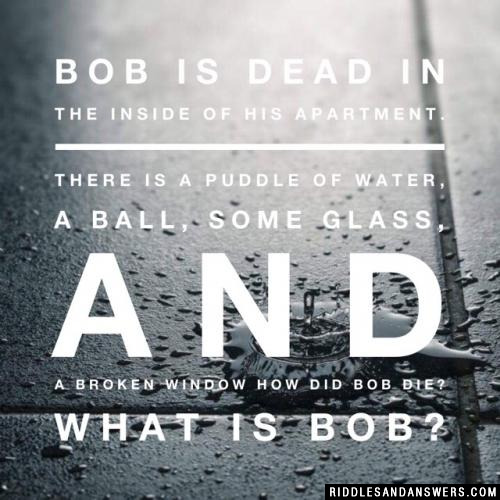 There is a puddle of water, a ball, some glass, and a broken window How did Bob die? What is Bob? Bob died by suffocating. Bob is a fish. 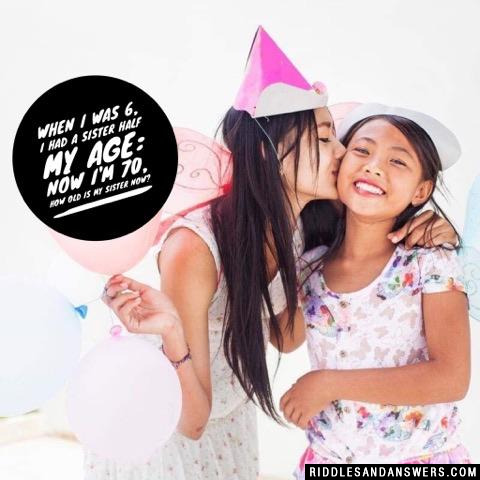 When I was 6, I had a sister half my age: now I'm 70, how old is my sister now? When you were 6 your sister was 6/2 = 3. You have a fox, a chicken and a sack of grain. You must cross a river with only one of them at a time. If you leave the fox with the chicken he will eat it; if you leave the chicken with the grain he will eat it. How can you get all three across safely? Take the chicken over first. Go back and bring the grain next, but instead of leaving the chicken with the grain, come back with the chicken. Leave the chicken on the first side and take the fox with you. Leave it on the other side with the grain. Finally, go back over and get the chicken and bring it over. 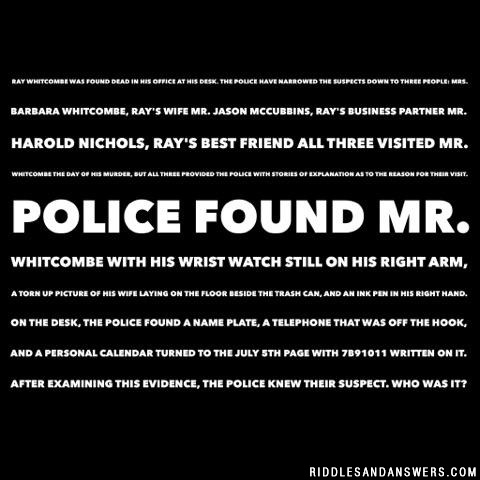 All three visited Mr. Whitcombe the day of his murder, but all three provided the police with stories of explanation as to the reason for their visit. Police found Mr. Whitcombe with his wrist watch still on his right arm, a torn up picture of his wife laying on the floor beside the trash can, and an ink pen in his right hand. On the desk, the police found a name plate, a telephone that was off the hook, and a personal calendar turned to the July 5th page with 7B91011 written on it. After examining this evidence, the police knew their suspect. Jason McCubbins, Ray's business partner. The calendar was the clue to solving this murder. The police realized that since Mr. Whitcombe was wearing his watch on his right arm, he must have been left-handed. Realizing that the number on the calendar was written in a hurry and with his opposite hand, police matched the written number with the months of the year. So the B was an 8, thereby giving us 7-8-9-10-11: July, August, September, October, November. 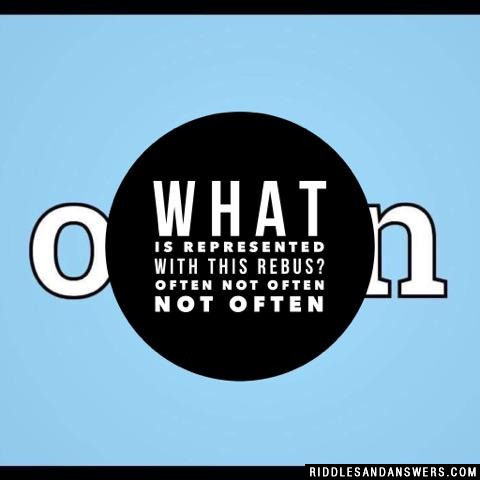 Use the first letter of each month and it spells J-A-S-O-N.
What is represented with this rebus? 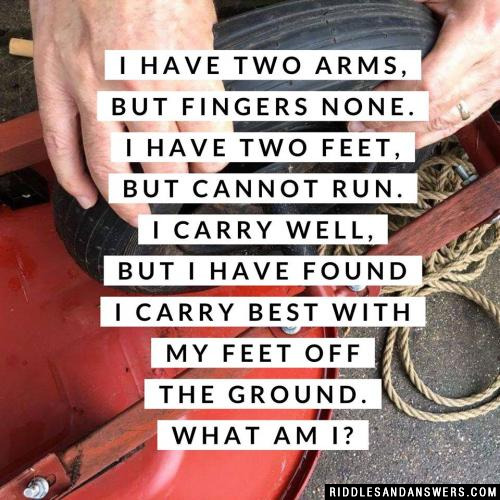 Can you come up with a cool, funny or clever Riddles To Solve of your own? Post it below (without the answer) to see if you can stump our users.